All Americans should be given this lesson. Those who think that America is an arrogant nation should really reconsider that thought. Our founding fathers used GOD's word and teachings to establish our Great Nation and I think it's high time Americans get re-educated about this Nation's history. Pass it along and be proud of the country we live in, and even more proud of those who serve to protect our 'GOD-GIVEN' rights and freedoms. 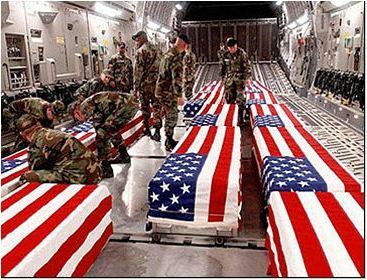 I hope you take the time to read this...To understand what the flag draped coffin really means...Here is how to understand the flag that laid upon it and is surrendered to so many widows and widowers: Do you know that at military funerals, the 21-gun salute stands for the sum of the numbers in the year 1776? Have you ever noticed that the honor guard pays meticulous attention to correctly folding the United States of America Flag 13 times? You probably thought it was to symbolize the original 13 colonies, but we learn something new every day!